This sconce can be mounted vertically as well; indicate when ordering which way you plan to position it for purposes of providing proper mounting holes. 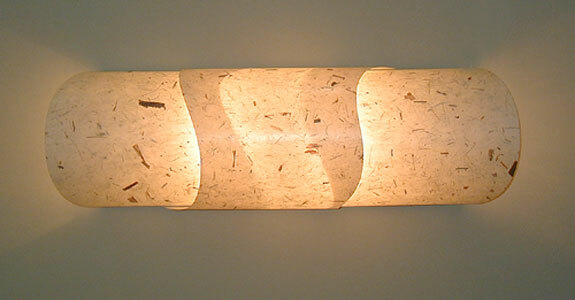 Ideal for placement above a bathroom mirror, this horizontal sconce has two light bulbs and an overlapping middle section that juts out a bit from the front, giving off light from under the "flaps." Paper shown is an off-white tan with flecks of plant material; other papers available. Holds two candelabra bulbs 40 watts max each.